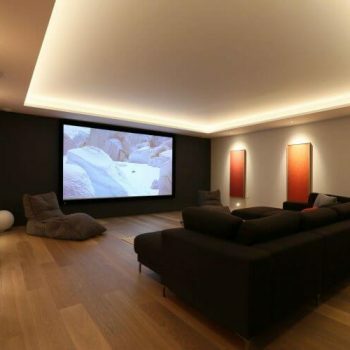 When considering your home theatre lighting, the first step is to look at the furniture arrangement – where is the screen going to be and how will the seating be arranged. It is essential to ensure that the lighting won’t reflect in the screen, so be careful what gets installed on the wall opposite. It is also worth thinking about how the room will be used. If it is just a cinema space, you won’t need a great deal of general interior lighting, but might want to add floor washers or a starry sky for an authentic cinema feel. However, if it’s also where you’ll watch sport, or a child friendly space it may be necessary to boost the general light levels with well positioned ceiling recessed LED downlights. The amount of day light in the space and how it will be restricted is also a factor, as are the acoustic properties of the room. 1.The variety of layers of lighting in this room really help open up the space. The brightest lighting comes from the Flush LED washing the framed posters and pooling onto the foot stool, whilst the circular coffer creates an ambient glow in the centre of the room. The lighting also helps emphasis the curved wall which is strikingly uplight with Luccas whilst Metal Squares create a real drama of up/down light. 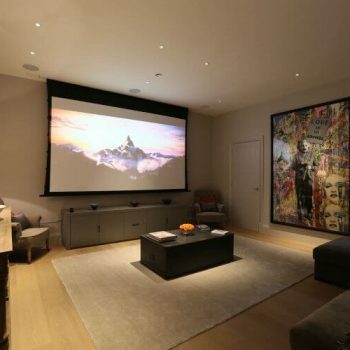 All circuits are controlled on a pre-set scene control to create a versatile space for both watching and partying. 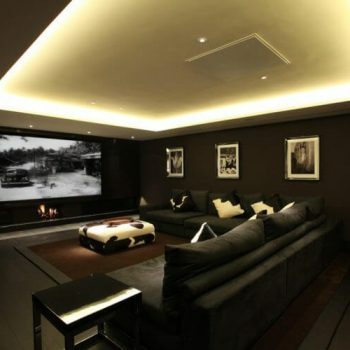 2.The lighting in this den-like cinema room is configured to soften the atmosphere. The addition of a coffer can help a home theatre as they don’t perforate any acoustic ceilings, keeping the spread of noise and any vibrations to a minimum. Light the coffer with Contour HD24 to create a warm shadow free light, with no nasty reflections or hot spots seen in the screen. Try to create some intimacy in a large room. Here, light is added to the centre of the space with two Polespring LEDs to highlight the coffee table, and to give a reading light to the sofa. 3.To create more of a family space, where the movie watching isn’t only an evening event, a fresher atmosphere is created with Contour HD27 in the coffer. If adding art, consider adding perimeter Polespring LEDs to highlight it. To generate an extra layer of lighting and additional mood, add an extra layer with low level Cazalla² floor washers. Leave this light source on for late viewing, to create a real cinema feel. 4.This cinema space doubles during the day as the main reception room, so the lighting needed to have the option to be bright. Splitting the perimeter Polespring LEDs from those pooling onto the coffee table helps change the focus of light, and draws the eye to the wonderful art. Lamps help create a soft warmth to the room for evening atmosphere.